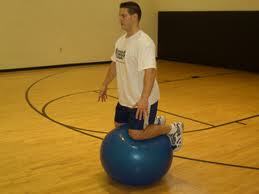 On Sunday I was a little under the weather and so today I exercised with the medicine ball. 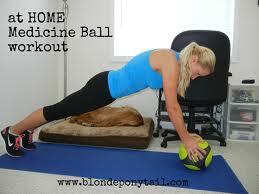 I notice on the Internet that a medicine ball is usually pictured as little. But the medicine ball I have is big! And that is the kind of ball I learned was called a medicine ball. That is a phrase I love! Other people can call it a resistance ball or exercise ball. But I will henceforth call it a medicine ball. Hahahaa... in the picture above, I love how in the background you see this dog snoozing. The dog has no use for exercise! I found this one impossible video. I did it a few days ago and today too. It made me feel like such a weakling! But then that is what a medicine ball is for, to make you strong and healthy. 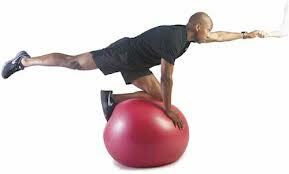 Plus there is something about exercising with a ball. It feels like play! Even if you are failing and falling all over the place. I was kind of weak so there were times when I just kind of lay there. But tomorrow I will be stronger! I long to be able to balance on the ball like a seal.